Basically, what are the daily necessities! And... of course, my bumble and bumble "sumotech" that I cannot live with out. It cures fly aways, smells good, and lasts forever! My calendar that has everything in it... it keeps me in check. My massive "everything" book - it has reminders, everything you can imagine. I can't live with out it! "She decided to start living the life she imagined" every time I look at it - it reminds me to. My Louis Vuitton Cosmetic Case carries my make - up necessities - mascara, eyeliner, & lip gloss. My Juicy sunglasses. Ugh, I hate when I forget these! My Key & Change Holder - that I use for carrying mostly jewelry & my credit cards & ID when I am with out my big purse. Key to my car - BUG! (She is white, just like in the picture if you click "BUG") My favorite car in the universe!! So excited to hear of your honeymoon plans.....are you visiting anywhere else in Europe? I love how you match all your accessories to your bag. I have such a hodgepodge of accessories--yours looks so chic when laid out like that!!! I loooove finding out what people carry in their purses! It's so interesting - seeing what others bring is a bit like a peek into their personality. I love how you're so organized & coordinating! My Mother gave me her Longchamp Cosmos bag and I confess everything but the kitchen sink is in it - it's totally a mess. I envy how organized you are that's a Blessing! I loveeee Louis Vuitton! 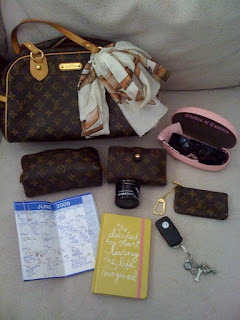 What an amazinggg gift for TL to get you :) I have the same wallet - seriously, it is just crammed full of EVERYTHING! You have the best things in your bag! Love this post, dear! Okay-I want your purse now and all that Louis Vuitton woman! i too am heavily in love with LV...love. love. love.